Coming of Age Day (Seijin no Hi) is an important Japanese holiday that celebrates young people who have turned or will turn 20 (the age of majority in Japan) between April 2 of the previous year and April 1 of the current one. The Japanese custom of celebrating coming of age ceremonies dates back to at least the 8th century. The coming of age ceremony named genpuku was modeled after a Chinese custom that originated in the early Tang Dynasty. The ceremony marked the transition from childhood to adulthood, which involved the assumption of adult responsibilities. Genpuku was held for aristocratic children aged between 10 and 20. The transition from child to adult status was usually denoted by changes in clothing and hairstyle. The present-day Coming of Age Day, however, is a relatively new tradition. It was established as a public holiday in 1948 and was originally held on January 15. Following the introduction of the so-called Happy Monday System, Coming of Age Day was moved to the second Monday of January to create a three-day weekend for employees who work a five-day week. Coming of Age Day in Japan is held to celebrate adulthood, congratulate young people who have reached or are going to reach the age of majority within the next three months, and help them realize that they have become adults. The holiday is marked with festive ceremonies held at local city and prefectural offices throughout Japan, often followed by after-parties with families and friends. The ceremonies usually take place in the morning. They are attended by young adults of relevant age who reside in the area. The newly recognized adults listen to speeches given by government officials and receive small presents. For young women, it is customary to wear furoside with zori sandals. A furoside is a style of kimono with extremely long sleeves made of very fine, brightly colored silk. It is considered the most formal style of kimono worn by young unmarried women. By wearing a furoside on Coming of Age Day, a young women signifies that she is a legal adult. Some parents buy furoside for their daughters to wear on Coming of Age Day but a full set of traditional clothing is very expensive. Those who cannot afford it usually rent or borrow from a relative. Since furoside has a very intricate design, most young women are unable to put it on without help. So many choose to visit a beauty salon before the ceremony to dress and get their hair done. Young men sometimes also wear traditional clothing (a dark kimono with hakama) but most prefer to wear formal Western clothes (a suit and tie). 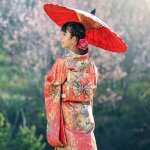 Attendance of the coming of age ceremonies has declined in recent years due to a number of reasons, including the shrinking percentage of 20-year-olds caused by Japan’s low birth rate and a general increase in the number of young people who have reached the age of majority but do not consider themselves adults. In addition, the age of majority in Japan was lowered to 18 years of age, taking effect in 2022. Because of this, the status of the holiday is somewhat unclear but it is unlikely to be discontinued.